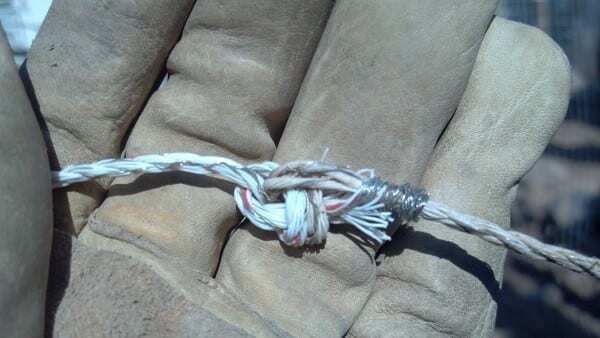 Although this method works for all destructive , escape-driven animals (dogs/horses/cows/etc), I get the most questions from frustrated dog owners on how to control their out-of-control pups….so lets talk about that for a bit. I know how frustrating it is to have a dog that no matter how many holes you plug in the fence, they always seem to find another way out. When nothing else works and you are about to get rid of the dog, try this first! It’s worked for me 100% on the hundreds of hard-to-contain foster dogs that I’ve cared for. I was a foster parent for a no-kill shelter for 10 years and was THE ONE they called when they had a fence jumper, fence climber, or just plain ATE through the fence to escape. I had it figured out how to stop this behavior once and for all and these homeless dogs were able to be rehabilitated from escaping, and were eventually adopted out to wonderful, permanent homes. 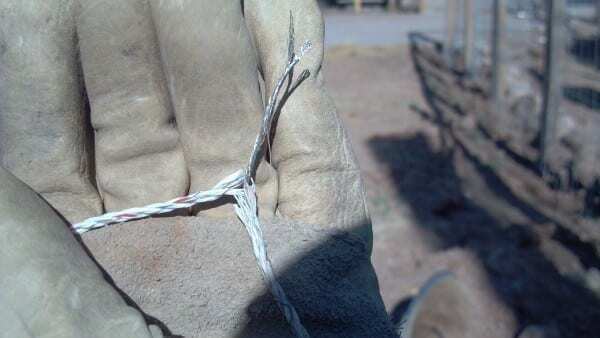 It’s called an electric fence, or ‘hot wire’. Unfortunately where I live, if your dog escapes, it’s legal for anyone to shoot him/her if the dog wanders onto their property…that is if the dog doesn’t get eaten by coyotes or gets hit by a car first. Needless to say, I had to figure a way to contain my much loved, hard-to-contain dogs. This method saves dog’s lives by keeping them in the yard, teaching them how to respect the fence that was put up to contain them in the first place. Before I put up the hot wire, ‘Chilidog’ was escaping daily, causing mischief in the neighborhood. I was afraid that he would eventually be shot or get hit by a car. 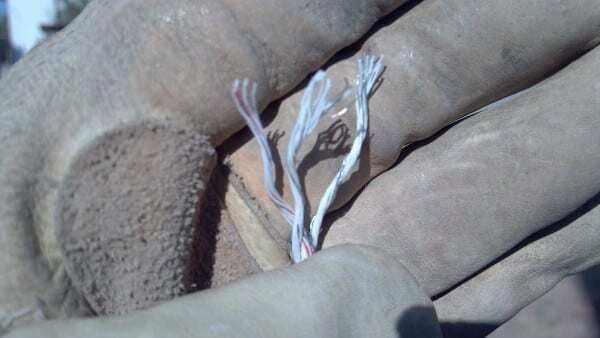 As you can see in the pic above, Chilidog shows no fear of the hot wire. He has learned to respect it and calmly walks along the fence leaving a respectful distance between him and the wire. 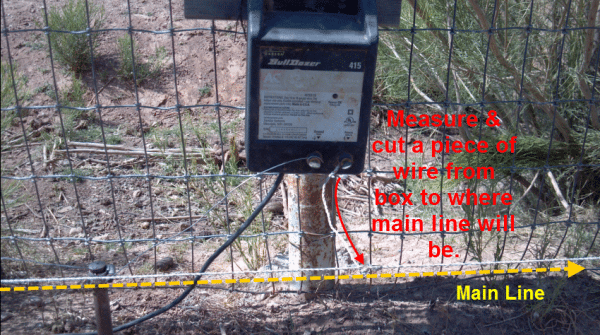 Electric Fence Box-do you need a lower watt box for smaller animals like dogs, etc. 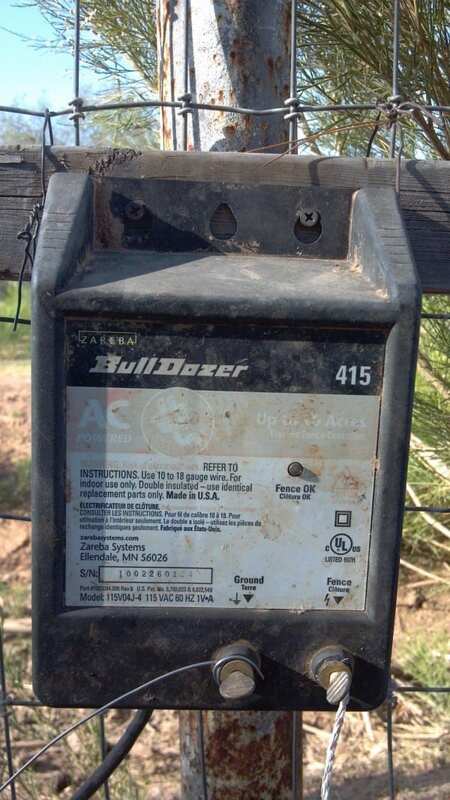 or do you need something stronger like a livestock electric box for larger animals? 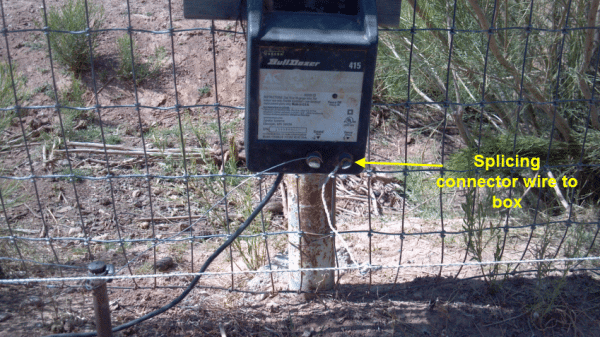 Locate where you want to put your electric fence box. I bought an electric weather-proof box that can be left out in the elements. I just screwed it onto a piece of wood and wired the wood to my wire fencing. Easy! For the homemade insulators I just cut off some strips of old garden hose and wrapped the hose around the top of the stake. 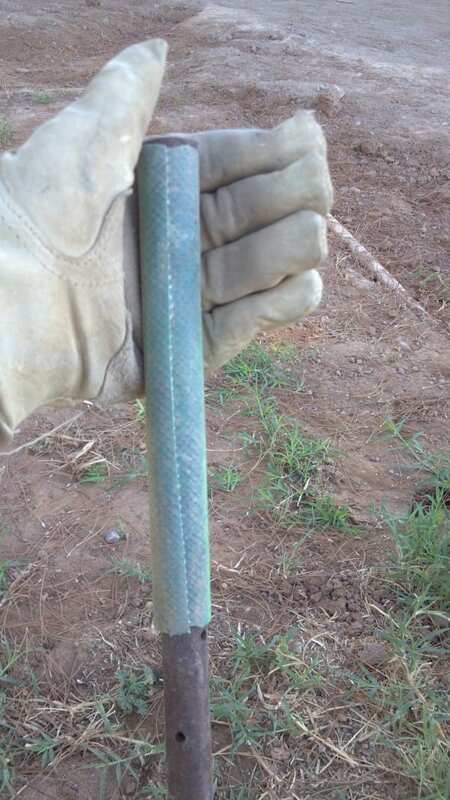 Make sure the hose completely covers all the way around the stake. Use two strips if needed. 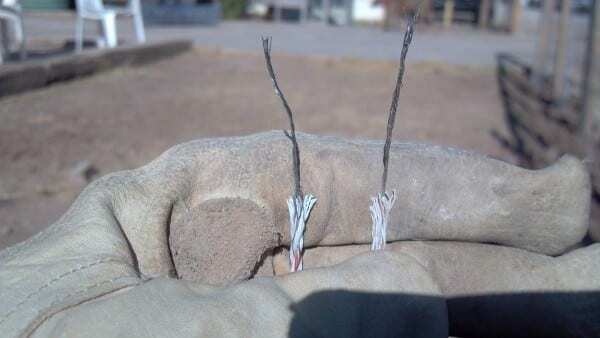 The hot wire will short out if it touches the stake and the hose prevents this by acting as an insulator when the hot wire is wrapped around the stake. 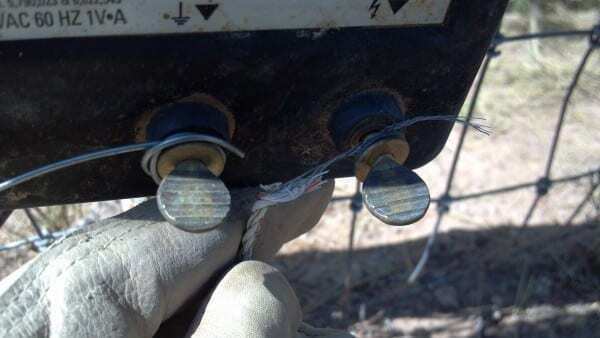 When you string the hot wire for dogs, you will want it about 6-10in above the ground so set your insulators accordingly to height. 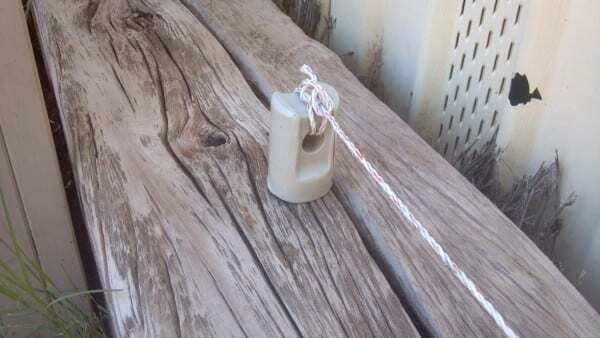 For larger animals like horses, set the insulators higher up on fence. Let the other end of the connector dangle for now, it will later be spliced into the main hot wire once you string the main hot wire up. 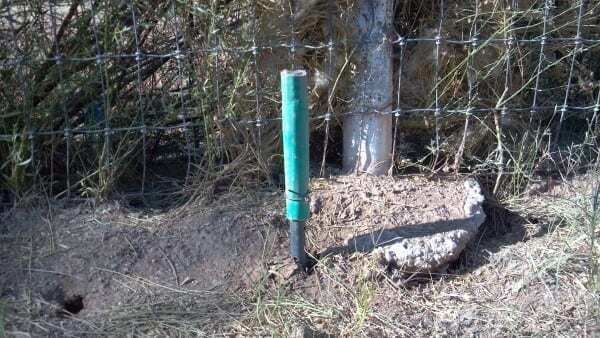 Fill in any holes along the fence that your dog or other animal has been digging or pushing through to escape. It’s time to plug er’ in and see how it works! 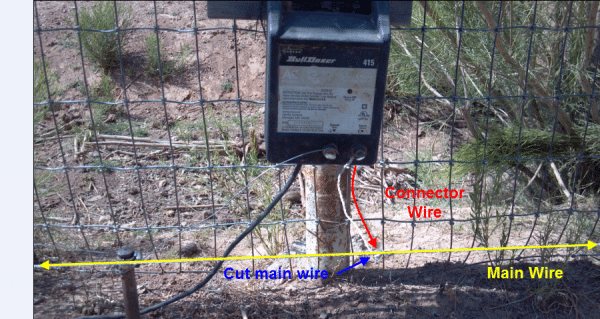 Make sure to use the electric fence tester to make sure hot wire is working. Horses usually learn quickly and only need to be reprimanded by the hot wire once or twice before learning to respect it. Dogs that are used to escaping may take 1-4 times of trying to go under or scrambling over the fence and letting the fence reprimand them before they finally get the idea to respect it. Awesome Tutorial. Thank you for taking the time to put it together with all the pics. Hello! Will this work if the dog’s feet are not “grounded” while they touch the wire? We have a 6+ ft cinder block fence that our neighbor’s dog is trying to jump, but she is completely off of the ground when she could come into contact with the wire on top of the cinder block wall. Good question! I’m assuming the dog probably jumps up, grabs the top of the fence with it’s front feet, then pulls itself up the rest of the way with it’s back feet. As long as the dog touches the wire while it’s touching the wall, it will shock him. So you might put the wire as close to his side of the wall as possible so when he pulls himself up, he runs right into the wire. We live in Nevada and get some pretty good gusts of wind and it is rather common to have fences blow over, which happened to us last night. Our dog got out last night, fence blew down while I was at work. Fortunately he stayed close (surprised me, he is a 9mo puppy). I don’t want to put electric wire on the fence because if it blows down, there goes my electric fence too. I purchased 24″ wood stakes and am planning on pounding those into the ground and attaching fence post insulators to hold the hot wire. Funds are tight seeing as how we have to replace a good 25ft of fencing. Do you see any problems arising with that method? I have had a bad experience with using the wireless pet containment system in the past so that would be a last resort for us. I think your method would work just fine with wooden stakes! So glad to hear your pup stuck around after the fence blew down, SCARY! What about for diggers? We have a fence up with a gap of maybe 8″ from the ground to the electric fence, keeps the bigger dog out but a neighbors dog is smaller and goes under. Need a fix. You could run a second string of hot wire lower to the ground to keep the smaller dog from going under. Well we have a 3 hot wire fence and some places have a clearing of up to 11″! We might just rock it or brick. Or maybe even chicken wire it. 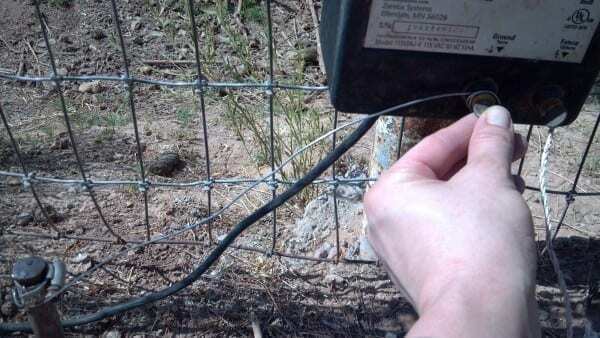 LOL…Yeah, if the hot wire is too far away from were the dogs slip through the fence then it won’t shock them. 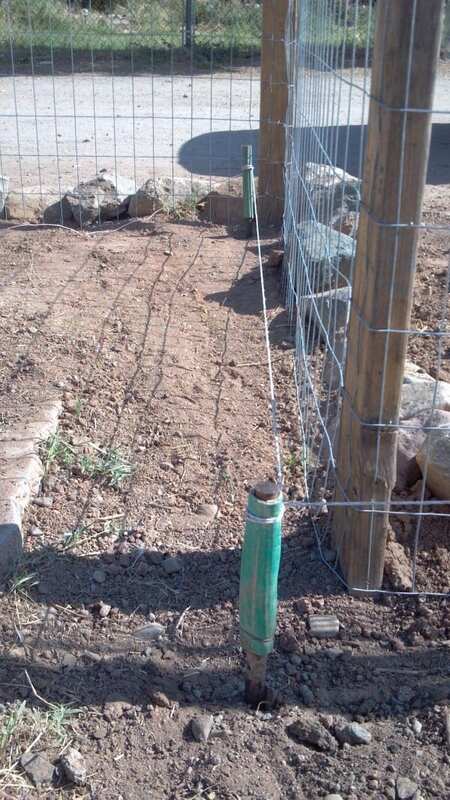 Good idea…Rock, brick, or chicken wire works well because they cant’ dig into the ground to make larger holes to slip through. Would something like this work for the top of a block wall to keep squirrels from getting into our fruit trees? They knock all the fruit down before its ripe so we end up with none. So frustrating!! That’s a good question Susan! I haven’t personally ever tried it with squirrels, but I’d think it would be worth a try! Let me know what happens! 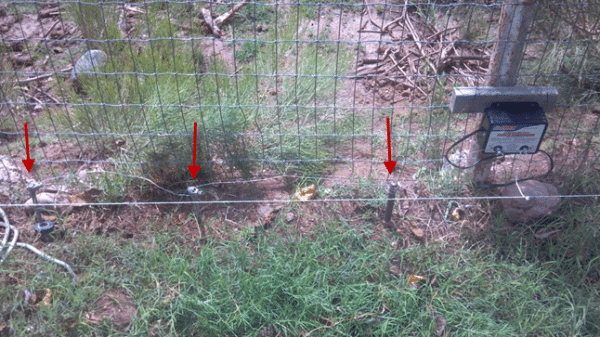 We just installed this wire fence system and apparently my dogs have been shocked. We set it up just before we had to leave out of town because they were constantly digging their way out. The problem we have now is they are terrified to go out in the yard. I really did not realize until I returned from the weekend away. I took them on their daily walk on Monday afternoon (late) and they both made 4-5 poops each. I didn’t think anything of it until the next day I went to scoop the poop and there wasn’t any. (BTW, pet-sitter walked them twice a day whilst we were gone). Then I realized they had been staying in the house all day and only going to the bathroom on their daily walk. Today we had our first ever pee in the house accident. Do you have any instruction to de-traumatize them? I have been trying to take them out there on a leash, and they tug and pull against it. And they are just terrified when out there, looking around like something is about to get them. I’ve tried shutting their doggie door so they can’t come inside and my dog is screeching her head off to get back in the house! Please let me know what I can do. These two dogs are normally never scared of anything – fireworks, thunder/lightning, nothing. Now I’m so worried about how traumatized they are. No worries, this is normal for lots of dogs. They just haven’t figured out that it’s the actual fence that’s shocking them…right now they think that just being in the yard will shock them. The only way they’ll get used to being in the yard is spending lots of time in it. 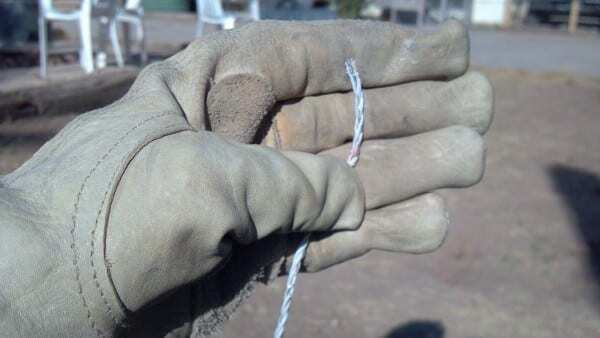 When I’m working with new dogs that are having a hard time adapting to the new hot wire, I usually plan a day or two of working in the yard to keep an eye on them. Usually the new dog will hide under the porch or by the door all day while I’m out there working and that’s OK. I basically just let them be and don’t force them out as they will start to venture out on their own time. 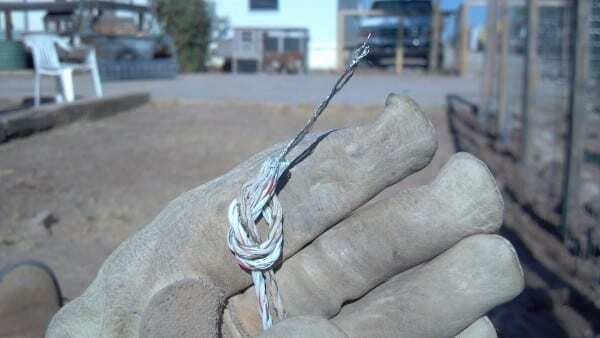 I’ve worked with hundreds of dogs with this and they have ALL adapted to the hot wire. Sometimes it takes a good 3 or 4 days (& sometimes a week) for them to start getting the idea but they won’t get better if they don’t spend lots of time outside. If you don’t have time to be outside with them, that’s OK too…lock them out for at least a couple hours a day (the longer they spend outside, the faster they get the idea) I know it’s hard to see them scared but I promise they will realize the yard is not a scary place…and it’s only the fence line that they have to avoid. Do this and you’ll be so glad you stuck to it. Try giving them treats (if they are interested) when they are outside so they start to associate getting rewarded for going out. Hope that helps! Thank you so much for your prompt response. I have been trying that, so I will continue and give them more time. I know my husband was happy I mowed the lawn this week so I could be out there with them! Thanks and I’ll let you know how it goes. 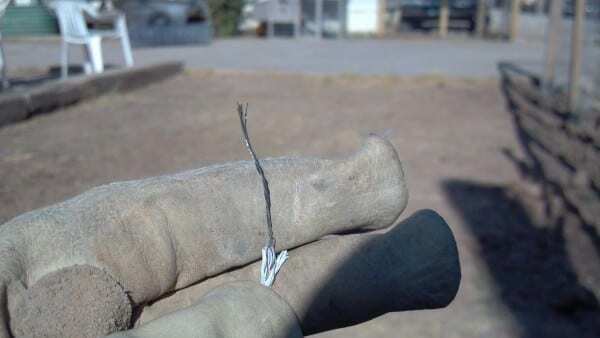 Rebar is a bad choice for ground rod. Steel + moisture= rust. 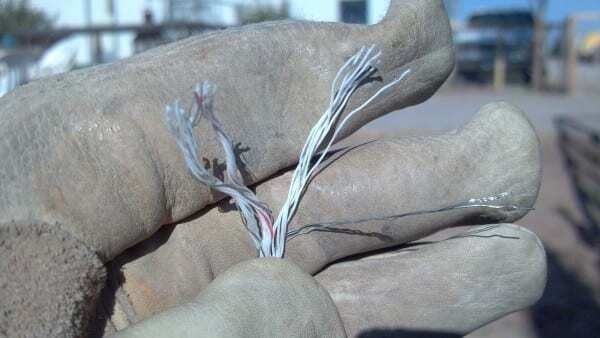 Rust + Electricity= poor conduction. My question is can I put my electric box next to my house (so as to use the outside outlet to plug into) and run the ground wire next to the house and the Hotwire across my property 120 feet away? Perhaps running Hotwire underground in conduit? That’s a good question…I’ll bet if you called an electrician they would be able to tell you. If you find out let me know! Hello, for those of you whose dog(s) are afraid to go into the yard after getting shocked, I’ve always had success walking them near the fence and saying “Owie-Owie”. Then I walk them away and go back and say the same thing several times. Then I let them off the leash and let them go near it by themselves and say the same thing. Of course, they may go out alone and get shocked, but they learn fast. All I have to tell mine now is “Owie-Owie” when they are loose and I’m walking off the property alone. They stay inside the fence even though I open the gates. I have German Shepherds and they used to scoot underneath the 4 board horse fence. Great advice Karla!! Thanks for the tips!! Can I zip tie the charger directly to my chain link fence instead of drilling holes in my house siding to hang it? I appreciate the tutorial and I bought all the stuff you recommended by clicking the links you made to Amazon. 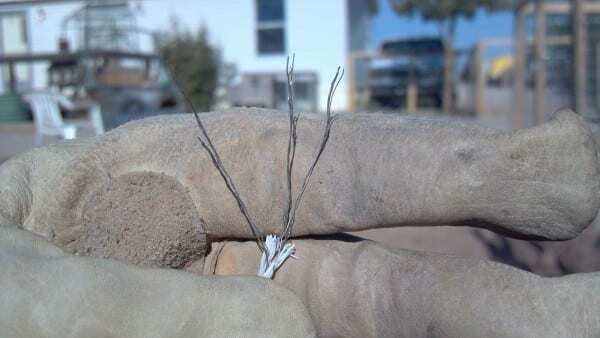 But now I’m realizing that although the link you made for electricity conducting wire takes you to a spool of Fi-Shock aluminum wire, you say later in the instructions that aluminum won’t work. Am I correct or is it just a misprint? Our fence shares another property. 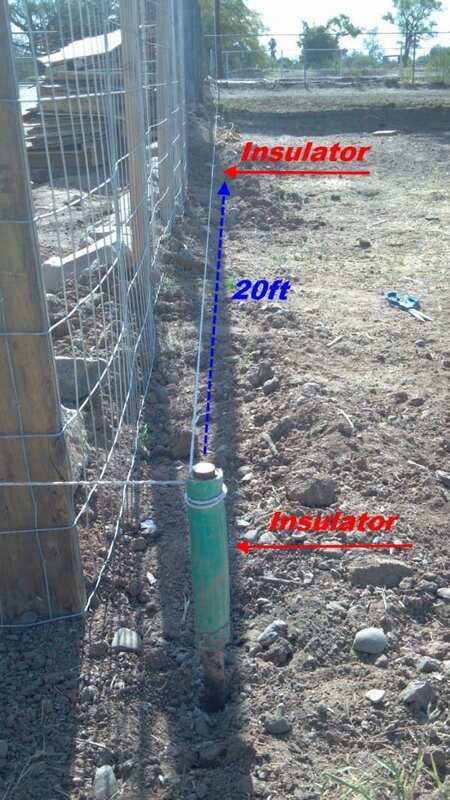 If I install hot wire on my side of the fence will my neighbors on the other side feel any effects of the hot wire on their side? Nope, they shouldn’t feel any effects unless they physically walk over and put their arm on your side of the fence and touch the wire. I’ve always shared a fence with my neighbors and have never had a problem. Hope that helps! The bottom pic shows a gate. How do you run for gates to be able to open and close without a break in the line? This has been a wonderful resource… I have a young black and tan coonhound who is incredibly hunting driven and digs out of our fence constantly. I am considering hotwiring the bottom, but my concern is with my smaller dogs, 2 dachshunds and a chihuahua. I am terrified they will be hurt by the shock which they are bound to experience at some point. I plan to place marking flags all along the line so they will learn but I am concerned for the little ones safety. I am looking at the charger designed for dogs, chickens and rabbits. What is your opinion on the smaller dogs and do you think marking flags help them learn faster? For dogs I prefer to use the Fido Shock which (unlike stronger livestock shockers), only gives out a shock strong enough for dogs. Through the years I’ve fostered and boarded hundreds of dogs in my home (including toy breeds) and have never had any issue with their safety. I’ve also never had a need to use the flags…they learn really quick what ‘bites’ them when they get too close to the fence and after a time or two will usually stay away. Hope that helps! 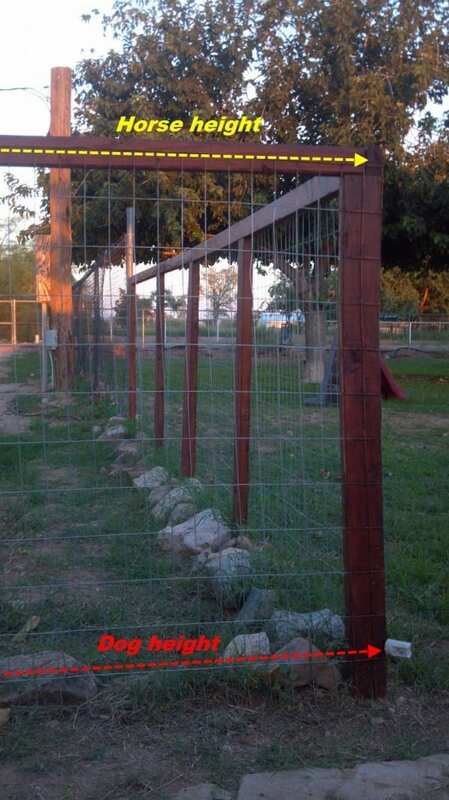 I need to wire just one fence to keep my horses from ruining the fence to get grass on the other side. How do I make a complete circuit back to my solar box when I’m not running the wire full circle on the perimeter of the entire fenced area. I only need it on one side? With respect to the “one side” only needed issue, the side I need to make hot is the west side of our enclosed yard. But how does one get power to it, short of having to run an extension cord to it from the house–not what I would want to do? You can use a solar powered hot wire box in which you wouldn’t need an extension cord. Amazon has a good one HERE. Hope that helps! Second post attempted here: I also need to run a wire on one side only. What works best for power absent a plug in? Yes, a line running along the top will work! I used to have a dog that jumped my fence so I ran a line up top, including along the top of the gate(I had to duck under the line every time I went through the gate LOL) It worked though, she never jumped it again! I also need to make hot just one wire (at least for starters…), what is reliable power source short of a plug in? I’m thinking of adding a “hot fence” onto my picket fence for my golden retriever who knocks boards out easily and runs away. He pushes the fence at a low point, so I would want the wire low. But what happens when we get a foot of snow and the wire is covered? I know nothing about electricity, obviously. Thanks for your tutorial, it’s great. Good question! You will have to shovel the snow away from the wire when it gets high enough to touch, otherwise the wire will ground it out and it won’t work. It’s the same thing with weeds. When my hotwire starts getting to where it isn’t working like normal, I walk along the line and usually find a large weed touching it somewhere. I simply remove the weed and the wire will work again, hope that helps! What happens when your dog pees on a low hot wire – pulsated at a level recommended for dogs. I’m worried it’ll kill them. I can’t find reliable information online. Many say it just shocks them. Others say it can kill them. Have you had experience with this? I’m thinking about just installing a higher wire for my fence jumper and being done with it. Good question! 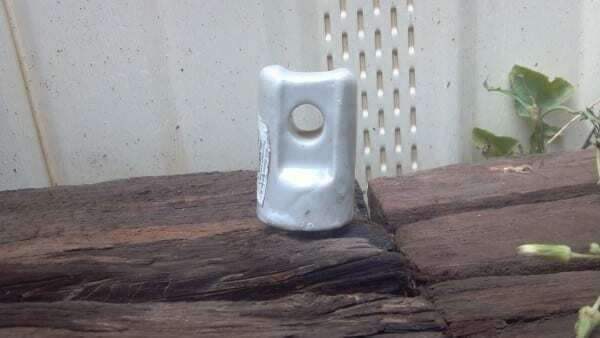 There are different strengths of hot wire boxes that range anywhere from containing livestock down to containing dogs. I’ve had both types and have been shocked by both myself. I’ll tell ya right now, livestock shockers definitely give you quite a wallop when shocked. My own larger dogs have always been fine after being shocked by them when wandering too close to the horse pasture. I’ve never had a little dog shocked by a livestock shocker but I’ve seen a feral cat or two shocked and they just ran off afterwards. For my dog yard, I’ve always used the smaller dog shockers (I left a link to one in my post). They definitely give off a lower grade shock and would be the one I’d recommend for smaller dogs if you’re concerned about it. When I used to run a dog boarding facility at my place, I had a dog shocker surrounding the large yard that the pups ran and played in. I’ve boarded every sized dog you can imagine (from chihuahuas to mastiffs) and all of them were fine after being shocked by the dog shocker, and they learned to respect the fence at the same time. About the peeing on the hot wire…I’ve never actually seen any of my dogs do this, but it’s not to say that they haven’t done it without my seeing it. With all the dogs I’ve watched through the years (probably hundreds), I’m sure it’s happened but they all survived and lived on to ripe old ages! I hope this helps! You will like this because you won’t ever have to worry again. The dogs learn to respect it and stay where they belong. Good luck! All of the ones I use pulse.